The first, and most important question to ask yourself is, “Should you?” It might be better to give the task to the professionals if you don’t have the time, patience, skills, or equipment. Memories Renewed is a service that I have used and which came highly recommended by TheWireCutter.com. Epson Perfection V600 with slide tray in use. I chose to do it myself because it satisfied several of my requirements. First, the number of slides—over a thousand—justified the purchase of a scanner. Some scanning services charge over a dollar per slide, and even Memories Renewed’s relatively low price of ninety cents per slide eclipsed the price of a scanner. Second, I needed a new scanner and the replacement would be used even after the slide scanning project. My old scanner was so ancient it required drivers purchased from a third-party vendor. And it was doubtful the drivers that I bought for Windows 7 would also work under Windows 10. So, it didn’t make sense to keep investing in the old scanner, especially since it lacked the ability to scan film negatives or slides. This was a good opportunity to upgrade to a modern, supported, and more capable replacement. 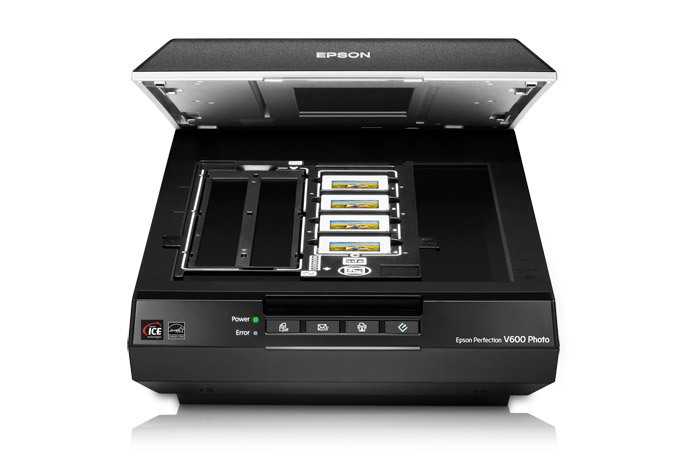 After researching my options and looking at reviews, I chose the Epson Perfection V600 scanner. And lastly, I had the time, patience, and the skills for this DYI project. It is not a technically challenging task to operate a consumer-grade flatbed scanner. However, photo-retouching does require a bit of knowledge. Old 35mm slides will have scratches, blemishes, color casts, etc. and you’ll want the skills to correct or mitigate these issues. The Epson scanning software has tools to address some issues, while others are fixed post-scan in photo editing software. I’ll touch on a few of the basics, but in-depth coverage of photo editing is outside the scope of this article. You shouldn’t, however, have any trouble finding free video tutorials on photo-correction topics such as histograms, gamma curves, HSB, etc. And any investment into those editing skills also apply to the photos you’re currently taking. In this article I’ll give you hints and tips on scanning 35mm slides specifically. Some of the tools and techniques apply to scanning film negatives and old photo prints also. This guide is not a replacement for your scanner’s manual, which should be the primary source of instruction. Rather this is a supplement to clarify topics that are omitted or ambiguous. So, if you’re up to the challenge of slide scanning, let’s look at the equipment that will be useful. A slide/film scanner differs from an ordinary flatbed scanner because it has special illumination to project through the film or negatives. Also, a slide scanner typically uses a tray to hold the slides in the specific location of that lighting. The Epson Perfection V600 scanner has this lighting and the included tray will hold slides or negatives. But particularly appealing is the scanning software, which includes Digital ICE that can remove or mitigate blemishes and damage on both film and photos. The results can be amazing sometimes, and sometimes they will make a scan worse. You should make a slide-by-slide decision on whether to use Digital ICE, since you can often get better results from manual corrections. You’ll want to remove any dust or dirt from the slides (and scanner flatbed) before scanning. The easiest method is to blow the dust away and I use a Giottos Large Rocket Air Blaster. Cans of compressed air can be too powerful, but they are useful for clearing your work area. 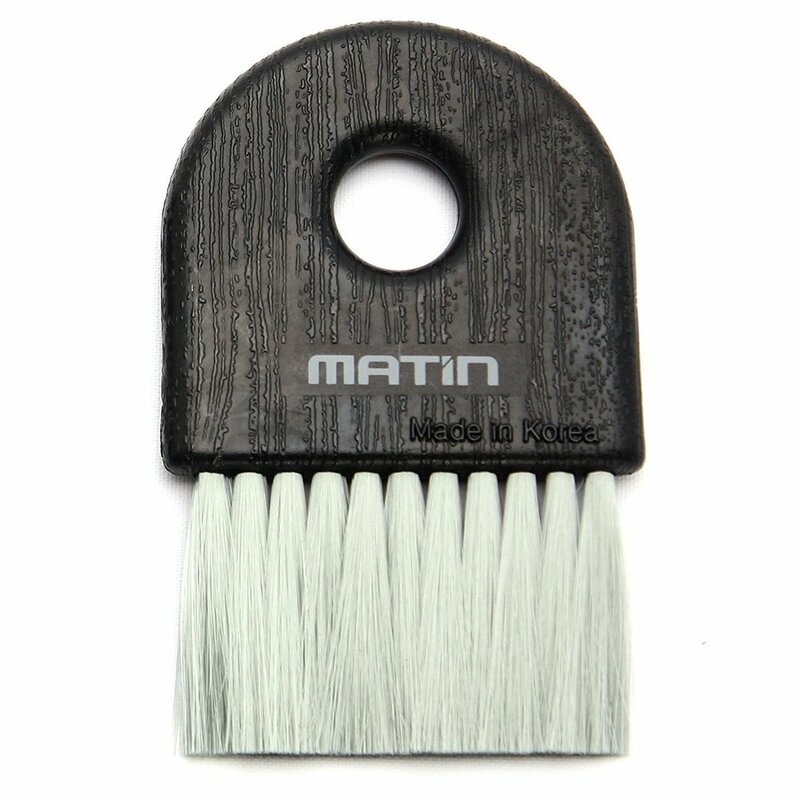 For stubborn specs that can’t be blown away, I use a soft photographer's brush. These two tools were sufficient to clean most of the slides. I did have some slides with mildew damage and used lint-free wipes to apply a special emulsion cleaning fluid. These tools could also be used to clean film negatives, although I would add cotton gloves to the mix to prevent fingerprints. But gloves weren’t needed for my project since I only handled the slides by their frames. Another way I protected the slides from fingerprints was by using a spudger. 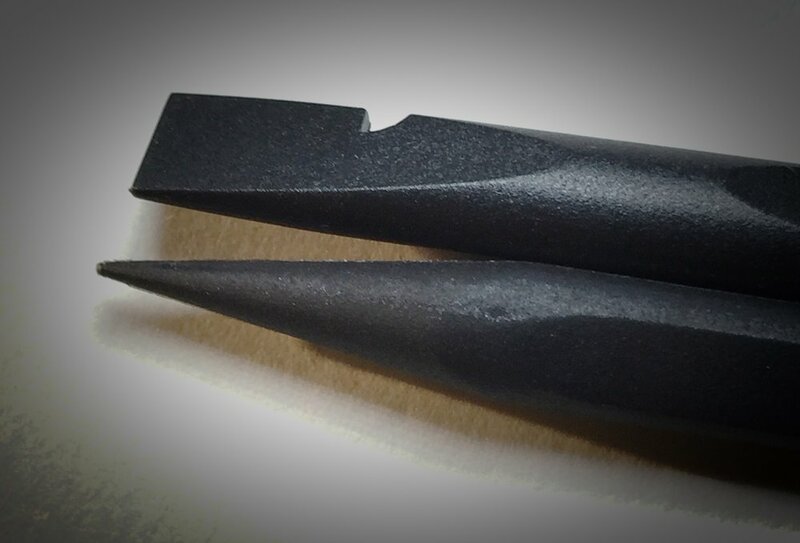 This is a tool with a point on one end and a flat screwdriver-like blade on the other. It’s made of nylon and won’t scratch the glass of the scanner’s flatbed. And it’s handy at lifting the slides from the tray. I already had several spudgers on hand (from my iFixIt toolkit), but they can be purchased by themselves. For a particularly stubborn slide, push it to one side of the frame and use the spudger tip on the opposite side to lever it out of the frame. A zip bag or a sealed plastic box should be used to store your brush, spudger, lint-free wipe, etc. There’s no sense leaving them out between work sessions to gather dust. Before scanning wash your hands to minimize the oils on your fingers. And wipe down your work area, so you won’t be kicking up any dust while you work. If you’ve dug out your slides from an attic or closet, the box is probably dusty. Take the box to a different area to clean it so the air in your work area isn’t full of floating dust motes that will settle on your scanner and slides. I learned the hard way that I also must prepare my work area by pausing my backup software. I use Google Backup & Sync, which gets confused when I edit photos. When I would go online to view the photos it showed the original version—not the finished version that had been corrected and edited. Therefore, I pause this software at the beginning of a session, and I don’t turn it back on until my photo editing is finished. I budget my time and work in batches, so I don’t scan more photos than I can edit, and thus ensure that the edited versions are what get backed up to the cloud. You should decide on a workflow and stick with it for a work session. A workflow is a series of steps that you’ll execute in the same manner, and in the same sequence, for each iteration. A workflow prevents mistakes and produces consistent results. You should position your tools and the slides to support your workflow. For example, I position the slide carousel to my left (since I’m working left-to-right) and rotate the carousel so the next slides to be cleaned are just below the 3 o’clock position. When I remove or return slides to the carousel I grip and rotate them the same way to ensure the emulsion side of the film is always facing the correct direction (more on that in a minute). Another workflow decision is what you will be doing while the slides are being scanned. For example, you could do photo-retouching on the images that have already been scanned. But I have found the process goes much faster if I work on cleaning and documenting the next four slides to be scanned. I can accomplish more if I focus only on scanning. Switching between scanning and editing feels more productive, but it is actually much slower overall. So, I save all the photo editing until after I’m finished scanning. Slides are placed on the flatbed of the scanner emulsion-side up. I’ve seen advice on using the text printed on the frame to identify the sides. However, my slide collection comes from photo labs in different countries and represented several brands, and I found that frame printing is neither consistent or dependable. Also, some frame brands didn’t even have text on them. To make matters worse, occasionally the film would be (even within one brand) inconsistently and incorrectly mounted. So, the best method is to always examine the film surfaces of every slide. May have brand name, logo, and/or “This side toward screen” on the frame. WARNING: Not all brands or labs follow this convention. May have slide number and/or date-developed on the frame. WARNING: Not all brands or labs follow this convention. Below are photos of different brands and style of slides showing the difference between their sides. The emulsion side is shown in the left column and the non-emulsion side of the same slide is to its right. Emulsion side: Dull and curves away from you. Also frame has the brand and logo. If you look closely, you can see the texture of the emulsion. Click to enlarge. Non-emulsion side: Shiny and curves toward you. Also frame shows slide number and date developed in red printing. Click to enlarge. The frame's markings below are opposite from the Kodachrome brand shown above. The film, rather than the frame, are the real indicators of which side is which. Emulsion side: Dull and concave. Note: the frame has a subtle V-shape edge on the left side, creating the illusion of being convex. Instead, look at the reflections and the hour-glass shaped light pattern on the film. It’s much easier to see in person that the film is curving AWAY from us. Click to enlarge. Non-emulsion side: Shiny and convex. Click to enlarge. Emulsion side: Dull and Concave. Barely discernible along the right border are the words “this side toward screen.” Click to enlarge. Non-emulsion side: shiny and concave. Also the frame shows (faintly in the top border) the slide number and date developed. Click to enlarge. 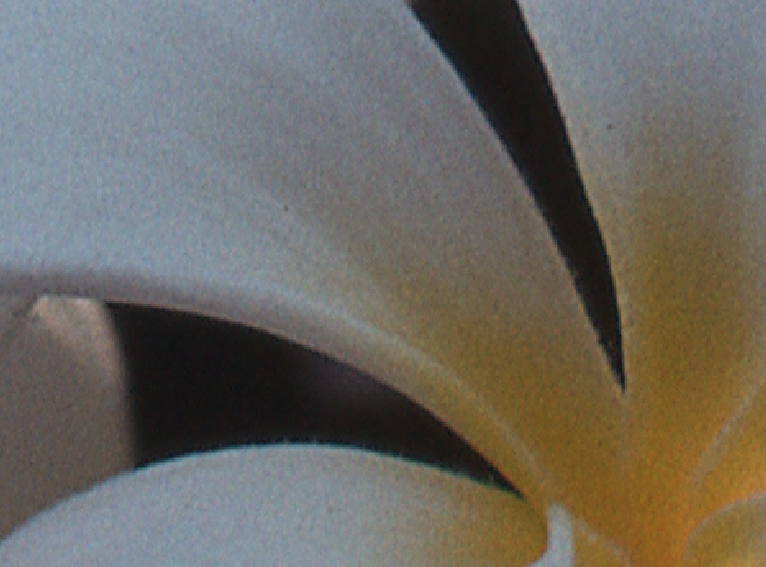 When you place a slide in the scanner’s tray, the emulsion side should face up (i.e., SHINY BELLY DOWN towards the glass). Also, be sure to rotate the slide so that the top of the image is towards the back hinge of the scanner. The tray for the Epson Perfection V600 scanner. Only the four square openings at the top are used for scanning 35mm slides. This tray sits on the glass of the scanner's flatbed with opening #1 towards the back hinge of the scanner. When you return the slide back to its carousel, the top of the image goes towards the bottom of the carousel. And the shiny belly will be facing a higher numbered slot. Slides in cardboard frames can warp over time, which can result in a suboptimal focus. You can sometimes gently bend the frames to compensate. But if they spring back to their warped state there is another solution: add a couple of empty, plastic frames on top of the slide when it is in the tray. This is just enough to allow the scanner lid to make contact and hold the slide flat against the glass. If the scanner adds black bars to a slide or crops it in strange ways, then it is probably because of light bleed. This light bleed confuses the scanner and it guesses the wrong slide size (inner window dimensions). The bleed is usually an outside edge and adding an empty slide frame on top will often stop the bleed. But sometimes you’ll need a special light-blocking frame. I made such a tool using an empty frame. I added black electrical tape so that it wrapped each edge of the frame, giving the frame a tiny increase in dimensions and a snug fit in the tray. On rare occasions, it would take two of these frames on top of my slide to block all the bleed. Because the tape on these special slides can peel back, I store them separately from all my other tools. This ensures no sticky residue transfers to any other item. And I check them before each use to make sure all the tape pieces are down and haven’t picked up a stray hair or other debris. 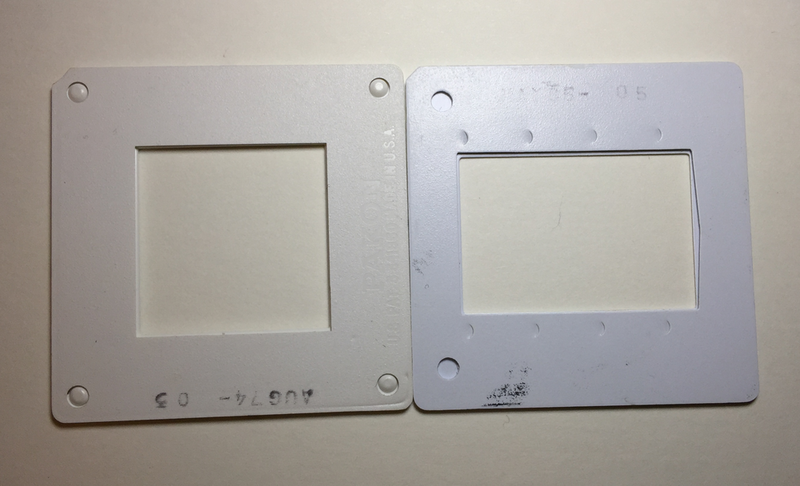 Also, when using empty frames to counter warping or to stop light bleed, be aware of the window shape. Most of my slides had rectangular windows, but I did encounter a handful with square windows. The empty frames need to have the same shape and size window as the underlying slide, and you should orientate them so that all windows in a stack align. The above problems fix the physical aspect of the slides to ensure a good scan. The Preview function is used to identify the issues and then again to validate they’re resolved. The next type of fix is made using software to correct defects in the film or created by the photographer. Major issues are fixed during the scan. These problems are over-exposure (too light), under -exposure (too dark), blowout (combination of extreme areas that are too dark and too light), and color cast (overall image is red, or yellow, or blue, etc.). Below is a screen shot of the settings that I use to scan 35mm slides. The very first item control is MODE and you must first set it to “Professional Mode” in order to access all the settings and tools shown below. You’ll also notice that this panel is divided in two with an ADJUSTMENTS divider in the middle. Before discussing the adjustments, I want to discuss the RESOLUTION setting. Memories Renewed uses a setting of 4000 dpi for their customers’ 35mm slides. But you’ll notice I have selected 2400 dpi. That is because I will not be printing out any of the resulting images. Instead they will only be viewed online, so making them bigger than the size of most screens is a waste of disk space. Also, larger images take longer for the scanner to create, longer to load, longer to display, and longer to transmit. Consider how you will use the resulting images and choose a resolution that makes sense for that scenario. In the adjustment tools (in the panel above) there is a row of icons. The only two that I use are the Tonal Curves (third from the left) and HSB (fourth from the left). I'll give some examples of how they are used below. But before moving on to that topic, I want to discuss the adjustment settings below the row of icons. I leave the UNSHARP MASK at Medium and have not yet encountered a need to change that setting. The COLOR RESTORATION is checked ON as needed on a slide-by-slide basis (with ON being most common). The preview will immediately improve if this setting is beneficial so you can make a decision without having to do a test scan and even without having to do another preview. And lastly, I will sometimes enable the Digital ICE setting. But this setting does display in the preview, so you’ll have to review any scans made with this adjustment. The review is necessary because sometimes Digital ICE will introduce undesired artifacts. Consequently, I only use this setting sparingly. Digital ICE added strange edges, adding one type of trash while removing another. Same image scanned with Digital ICE turned OFF. In the photos below, the image on the left is an unadjusted image with a red cast. This is caused by age (tends to happen to certain film brands). The next image, just to the right, is a dramatic improvement. This adjustment is a result of setting the COLOR RESTORATION checkbox ON. The image below and to the left has a blowout issue. This happens when a photographer is facing a bright light in the background, which cause the foreground to be too dark. To correct lighting problems such as blowout, over-exposure, and under-exposure, I use the Tone Curve adjustment. In the next photo you can see this tool floating over our sample image. The shadows are not quite as deep and the sky isn't quite as glaring. These adjustments were made by changing the curve in the adjustment tool. In the grid above you’ll see a faint, straight, red line running diagonally from the lower left to upper right corner. This is represents the lighting before adjustment. By clicking the line and dragging you can change the straight line to a curve. You can also move the endpoints of the line to adjust the lighting. The bands along the sides of the grid indicate whether you're adjusting dark values (lower left) or light values (upper right). Wherever the line curves upward the values get lighter, and wherever the line curves downward the values get darker. In my curve the very darkest shadows remain unchanged, but everything else gets brighter. That is, except the very end of the curve. The upper-right end doesn't meet at the grid corner but instead curves down, which makes the extreme whites not so bright. A full discussion of tonal curves is beyond the scope of this article. The best way to get the gist of this tool is by experimenting, since the preview will change in real-time and give immediate feedback. And the Epson software has a RESET button if you want to remove a curve experiment you’ve just tried. The Tone Curve also has radio buttons along the mid-left for color channels, so you can adjust the curve for reds only, greens only, and/or blues only. The other tool for controlling color is the HSB tool (HSB stands for Hue, Saturation, and Brightness). The Hue slider is used to shift the overall image toward red or blue. The saturation slider is used to give dull images a punch of color. Or, conversely, if the colors are excessively vibrant, you can desaturate them to more natural tones. Or, alternatively, you can completely desaturate a photo to convert it to a black-and-white image. Some brands of film accentuate reds, so you can choose to desaturate only the reds to bring the photo into balance. The fixes by the scanner correct the most egregious problems that tend to change the photo overall. 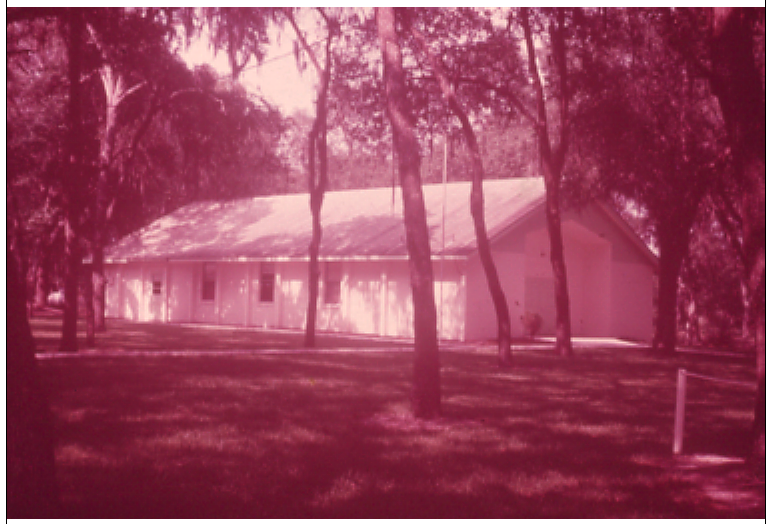 Tweaking and cleanup of individual areas of a photo are applied after the scan. Some fixes such as color adjustments, cropping, and resizing can be achieved using a free photo editor such as paint.net. But I’ve found Adobe Photoshop Elements is exceptionally good at red-eye removal, dust and blemish removal, and fine-tuning lighting. The healing brush alone is worth the price of this package.